Can insulating graphene oxide contribute the enhanced conductivity and durability of silver nanowire coating? 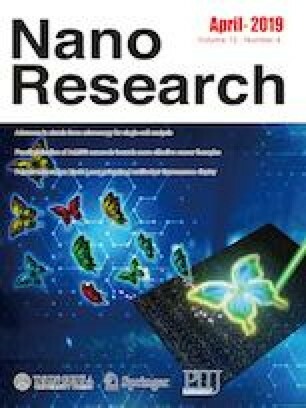 As an essential component of flexible optoelectronic devices, transparent conductive films made of silver nanowire (AgNW) have attracted wide attention due to the extraordinary optical, electrical and mechanical properties. However, the application of AgNW coating still faces some challenges to be overcome including large contact resistance and poor durability. Here, we induce insulating graphene oxide over silver nanowire network through solution process to modify the electrical property and provide a protective layer. Strong interaction with substrates reducing the contact resistance of AgNW junctions and extra conductive channels of graphene oxide sheets contributes to the dramatic enhancement in electric property as well as durability. The resulting coating exhibits superior and uniform optoelectronic performances (sheet resistance of ~ 38 Ω·sq−1 with 91% transmittance at 550 nm), outstanding stability in harsh environments, strong adhesion, and excellent mechanical flexibility after 3,000 bending cycles at a bending radius of 2.0 mm, which imply the promising application prospects in flexible optoelectronics. Feng Duan and Weiwei Li contributed equally to this work. Supplementary material (electrical properties of hybrid coating on different substrates; more materials characterization; digtal images of bending test and structure of resistive touch panel) is available in the online version of this article at https://doi.org/10.1007/s12274-019-2394-8. The work is financially supported by the National Natural Science Foundation of China (Nos. 11890682, 11832010 and 51861165103).